The New York Times visited an Amsterdam Toool gathering last week and wrote a nice article about it (PDF) …. This entry was posted on Wednesday, September 16th, 2009 at 09:29 and is filed under Uncategorized. You can follow any responses to this entry through the RSS 2.0 feed. You can leave a response, or trackback from your own site. Fantastic, what a suprise to open the NYT and read about my friends from Holland! Congratulations on yet another good locksport article in a major American newspaper! First WSJ and now NYT, very well done! I have scanned the actual newspaper in for those who would like to see how it looked in print. Sorry about the 2 pages, no Photoshop handy where I am. 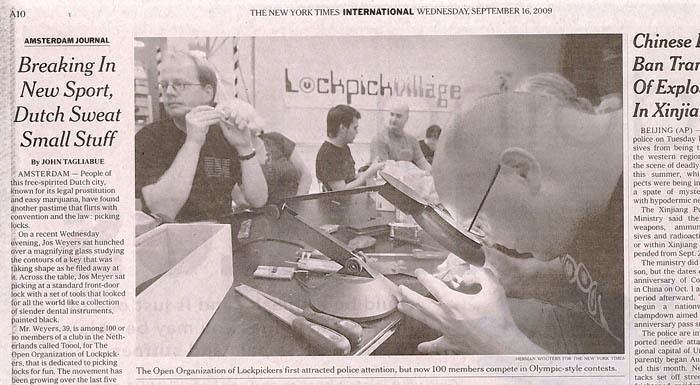 Also, I know that many members of SSDeV – the German locksport organization – did help lock manufacturers on many occasions. Bar! Contact me ff gozer. Entries (RSS) and Comments (RSS). 51 queries. 0.964 seconds.